Father John Hespelein became pastor in 1855, at the beginning of a time of great expansion and population growth. From 1850 to 1870, the population of Detroit almost quadrupled, passing the 80,000 mark before the Jesuits founded Detroit College in 1877. Almost half of these people were foreign-born. New German parishes sprang from St. Mary’s: St. Joseph’s in 1856, St. Anthony’s in 1857, and St. Boniface in 1869. This was due at least in part to the compulsory military service that was being forced on German men by the Prussians during the mid-1860s. Many chose to leave their native land rather than go to war. After the 1879 Vatican Council declaration of the infallibility of the Pope, the “Iron Chancellor” Prince Otto von Bismarck waged a “Kulturkampf” (“culture war”), exiling or suppressing many religious orders and dismissing or imprisoning disobedient priests. Half of Germany’s bishops were displaced and many had to flee for their lives. Not until 1883 was a compromise reached and then the only repressive laws to remain were the proscription of the Society of Jesus and the law making civil marriages compulsory. In the meantime, changes were the order of the day for St. Mary’s. In 1859, Father Theodore Mayerus became pastor for a year, followed by Father Louis Claessens, who pastored for two years before Father Francis Van Enstede assumed the reins. In 1864 a new house was built for the Brothers on Macomb Street and in 1865, land was purchased for a new school, across the street from the church on St. Antoine. 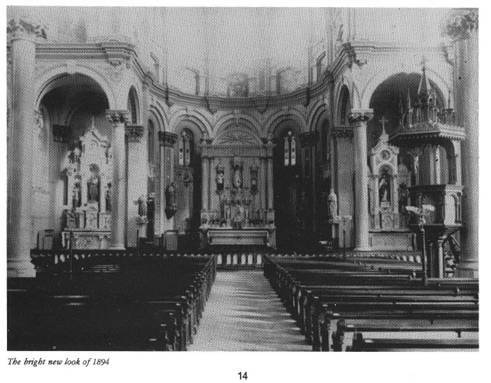 Father John Hespelein returned to St. Mary’s in 1866 and had the church debt completely paid in time to start the school construction the following year. The cornerstone for St. Mary’s third school was laid on June 14, 1867. In 1868, Father John DeDyker took over the parish and the completion of the school, which was occupied in February 1869 – the north half for the Brothers and their boys and the southside for the Sisters and their girls. School enrollment then was about 900. On March 4, Bishop LeFevere died from an injury suffered the year before, during his visit to a mission in India. He was buried in his beautiful SS. Peter and Paul Cathedral. On May 8, 1870, Caspar Henry Borgess, chancellor of the Archdiocese of Cincinnati, Ohio, was installed as Detroit’s third bishop. German and Irish national parishes were firmly established by that time, but in 1871 came St. Wenceslaus for the Bohemians and St. Albertus, the first of many Polish parishes. St. Aloysius Parish in downtown Detroit was formed in 1873 and was named the pro-cathedral in 1877, when SS. Peter and Paul was turned over to the Jesuits who also opened Detroit College that year. This, of course, later became the University of Detroit. The Franciscan Fathers from Cincinnati replaced the Redemptorists at St. Mary’s in 1872, with Father Appolinaris Hattler being the first to assume the pastorate. He staged a fair in the new school hall which netted over $4,000 as the start of a fund for a new church building. He also led the construction of a three-story brick house on Macomb Street for the Christian Brothers. This building cost $12,000. When Father Heinzmann assumed the pastorate (one history says he was preceded by a Father Kurtz) in 1875, one of his first acts was to set into motion the removal of the Christian Brothers. This caused such a ruckus – almost a revolution – in the parish, that he was quickly transferred out. His successors were the proud inhabitants of the beautiful new rectory completed in 1876 – a gem of “North Italian Banded Romanesque” design by the architect Julius Hess. It replaced the old rectory, which stood on Croghan (now Monroe) Street about ten feet east of the church. When Father Nicholas Holtel assumed the pastorate of St. Mary’s in 1878, he was able to soothe the ruffled feelings of his parishioners and form again a cohesive unit. By the time his successor, Father Francis Lings, took up the reins, the school enrollment encompassed 600 boys and almost as many girls. Father Lings asked several architects to design a new church for St. Mary’s. The plan chosen was that of a parishioner, Peter Dederichs. His design combined facets of Pisan Romanesque and Venetian Renaissance to create a unique and beautiful structure. The people were solidly back of this project and took a strong interest in every detail from the initial bidding to the final decorative touches. The lower part of the old church’s alter, built by the Redemptorist Brothers, was moved up into the school hall, and the upper part was put into storage. All of the old church property that could serve an immediate purpose was transferred to the temporary church. The old (1844) school, which had served as a social hall and meeting rooms after the 1868 opening of the new one, was torn down to make room for the new church. The old church was also demolished – a sad sight to so many who had worshipped there through the years. A mad scramble for souvenirs left stars and crosses from the ceiling decorations in the proud possession of the descendants of those whose energy, frugality, and devotion had made the treasured buildings possible. As soon as the wrecking operations were completed, excavation work was begun, foundations were laid, and on July 20, 1884, the cornerstone was set into place. Prior to the cornerstone laying, the parishioners formed a parade. Led by a Hessian military band, who were on tour through the United States, they marched the principal downtown streets. A splendid sacred music concert was given by this band after the festivities were over. 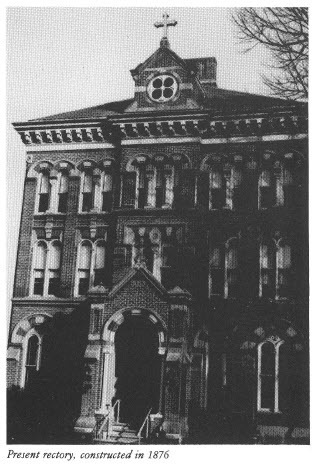 The building was completed in 1885 at the cost of $81,210.53. Today, its elegance and old-world-master craftsmanship could not be matched at any price. Twin spires above granite pillars, spacious vaulted ceilings, intricate paintings and carvings, golden details, exquisite stained glass and rose windows, bring soothing balm to today’s harried commuter just as they did one hundred years ago to the devoted souls who worked to provide this blessed sanctuary.